I’m SO SO excited to share Atli’s Play kitchen! We’ve been working on it for a while and he’ll see it for the first time on Christmas morning. We cannot wait! 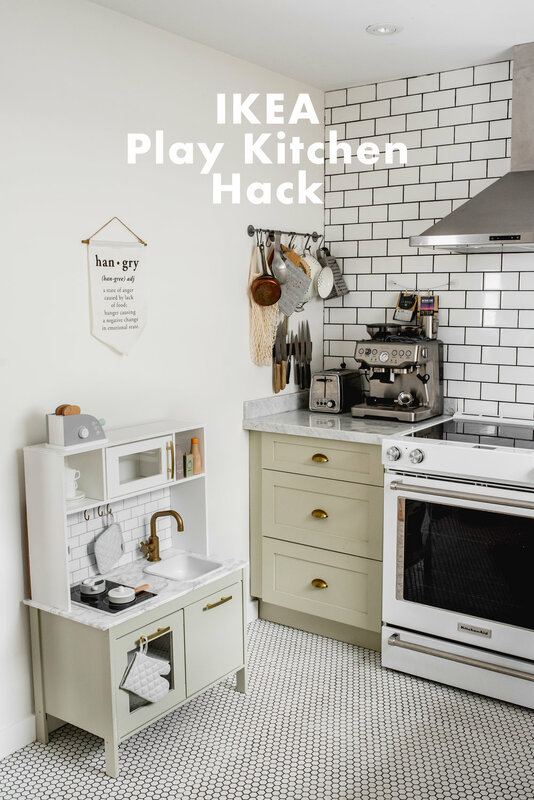 Matt was adamant that the play kitchen be a mini version of our own kitchen so we had a few hurdles we had to overcome but it came together beautifully. Are we so extra or what?! I was trying to find a way to remove the microwave (since we don’t have / use one) and replace it with an oven hood but it was getting too complicated and I wasn’t patient enough. Plus we had like 50 million other things on our To Do list before it got too cold outside and we just needed to finish this project. I think I had the most fun finding all the little details to pull it together and make it kid friendly but still match our style and fit well with our home decor. I honestly think this play kitchen is more for me than Atli. He’ll probably like it for .5 seconds, throw everything on the ground and move on. In any case, I love it so much. I hope he does too. Since there is still some time before Christmas, you can totally make your kids one and be the coolest parent ever! I’ve linked to all the sources below. Before painting, we laid out all the pieces and sanded each one. After sanding, I wiped them down with a tact cloth. Using painters tape and newspaper, I taped off the “glass” pieces as well as the cooktop. I started by priming each piece using this primer. I did 2 coats on each side before separating all the pieces from the top and bottom. I painted the top pieces with Behr Premium Plus Ultra Paint + Primer in One Semi-Gloss paint in Polar Bear. I painted the bottom with Benjamin Moore Spanish Olive, the same colour as our kitchen cabinets but I used CIL Furniture & Cabinet paint with Melamine as my base. It’s strong and doesn’t chip! I used white spray paint to paint the grey edge of the cooktop and the sink to match our kitchen. Then I taped off the sink drain and used a bronze / gold spray paint for that. It was tricky and it’s not perfect but it’ll probably get messed up anyways with Atli slamming stuff so I’ll just redo it when it needs some extra love. I also spray painted the grey plastic faucet and the metal rod + plastic hanging hooks with the same bronze spray paint. Make sure to spray paint outside, in a well ventilated area and wear a mask too. I did a couple passes with the spray paint (letting it dry completely between coats). The cabinets themselves didn’t need sealing since I had primed and used a good top coat of paint. Behr Premium Plus is amazing quality as well as the melamine paint. I sealed the things I spray painted (edge of cooktop, sink, faucet, rod and hooks) with this top coat sealer. It gave it a bit of a shiny finish and hopefully makes it a longer lasting although I have come to accept that it’s going to get messed up and that’s the joy of being a child and discovering things. Then when we have to fix it up, Atli can watch and maybe help in a few years. We weren’t huge fans of the hardware provided, but the holes were already there. Rather than try and find hardware that would fit exactly, we filled the existing holes with wood filler. Then we sanded it down and redid it a couple times until it was smooth and perfect. After painting the boards and putting the kitchen together we were ready for hardware. 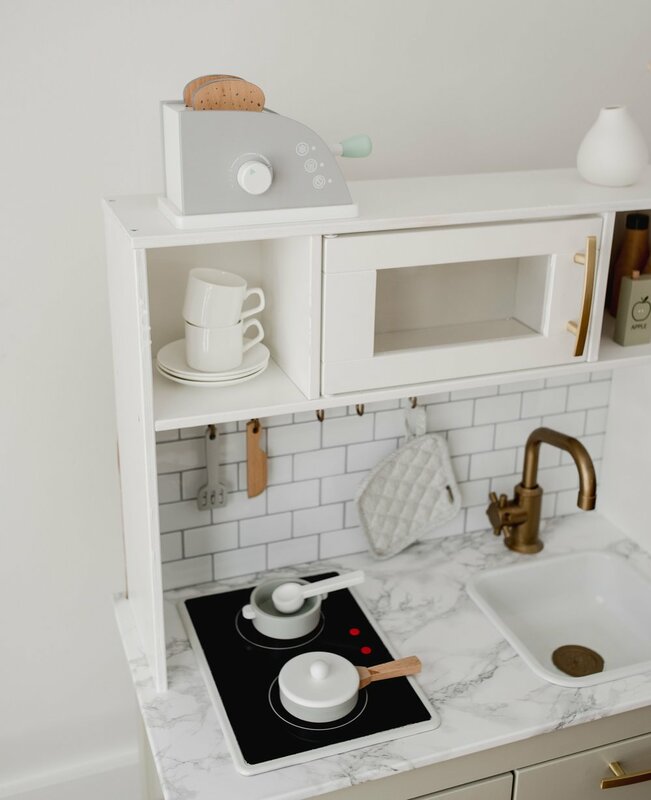 We wanted something affordable but also something that would match our kitchen hardware. We found these at Home Depot! We love how it looks. We knew right away we needed to make his countertop marble as well. The most durable, cheapest and easiest option was to use contact paper. It was a bit tricking working it. 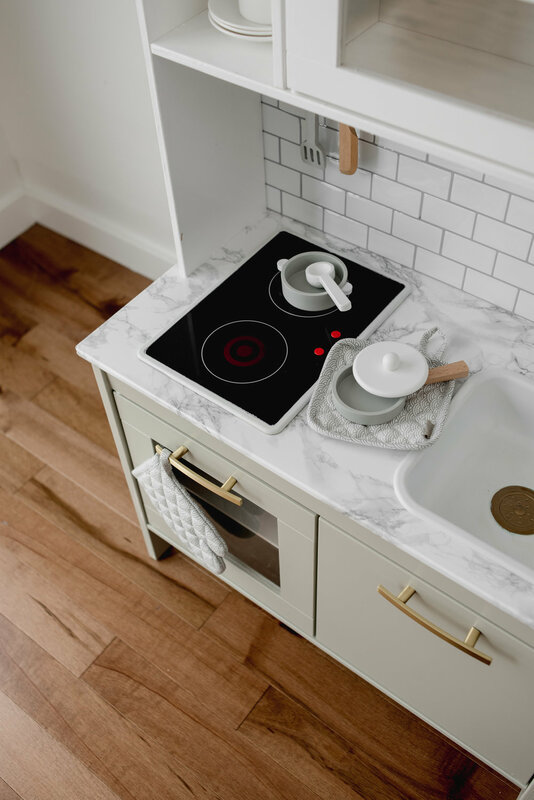 It’s one seamless piece that I carefully cut the holes for the cooktop and the sink / faucet and together we were able to put it on without too many issues. We had some wrinkles the first try so we removed it and tried again to get it perfect. The last bit to tie in our kitchen was the backsplash. Obviously it was too much to actually use subway tiles but I wanted the same look. Lucky us, there are lots of stick on adhesive backsplash options and we found the perfect match in these ones! Matt cut to size some backer board and did a great job aligning the sheets so it looks seamless. Then he screwed in the board to the back of the play kitchen and voila! This was such a fun part for me, I love accessorizing so when it came to Atli’s kitchen, I didn’t skimp on anything. Since this is his only Christmas gift from us (Matt got him this Cat Dump truck too which is so cute) I wanted all the details to be amazing for him, even if he has no clue what each of the toys are just yet. The first thing I saw that I needed, and by need I mean I was going to die without it, was this wooden toaster. I couldn’t get over how the colours basically matched the kitchen perfectly! It also came with slices of bread, a plate, knife, jar of jam and butter. Here is another toaster that is super cute, half the price and shipping is cheaper! I want to fully accessorize his kitchen but I’m running out of real estate. How adorable is this wooden espresso machine (Matt really wants me to get this one)?! I found this wooden pot and pan + utensil set that also seemed to match the kitchen. It was meant to be! There are lots of alternatives like this miniature white pot and pan set or this copper pot and pan set. Both so cute! Also, there is a mega sale going on for kids toys at the links for those pots and pans so check it out! I’m still on the hunt for cute little plates and espresso cups but for picture purposes I just put some of our own ceramic espresso cups and plates. I’m a little obsessed with this oven mitt set I got him. I love the design and kind of wish there was a bigger version I could use. Lastly, I got these wooden groceries. it came with a crate and a few more items. I also really like this wood fridge grocery set and this wood pantry food set both of which are on a HUGE sale and nearly half off for Black Friday! Go snag yourself one! I think I covered everything! Let me know if there’s something I missed. Also, I’d love to see what you create for your little one by linking in the comments or tagging me on instagram.